'Julia Phelps' is considered one of the most beautiful lilac hybrids. 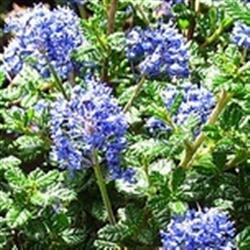 It has profuse, intense, dark blue flowers tiny crinkly dark green leaves. Julia Phelps grows 6 to 8 ft tall and about as wide. It is very drought tolerant and will survive with a few spring or winter waterings inland and no extra water on the coast.